Okay let’s get started. 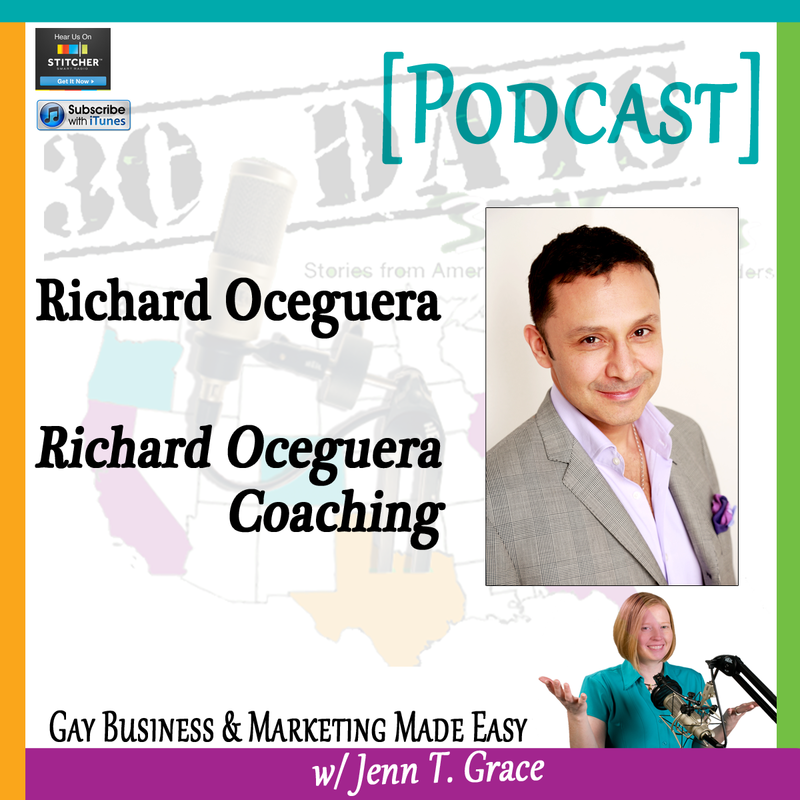 I am pleased to be talking with Richard Oceguera of Richard Oceguera Coaching. He is a transformational business coach, a speaker, a thought leader, and a community advocate. In addition he is the author of a new book called ‘Convert your Community to Cash, Monetize your Connection.’ Richard has played a key role in the startup of several organizations, most notably as the founding president of the National Gay and Lesbian Chamber of Commerce, New York. 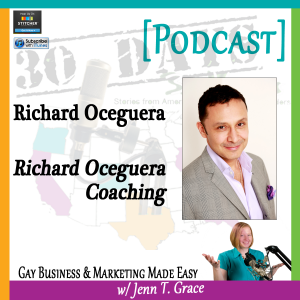 Richard, I have given the listeners a brief overview of who you are, but why don’t you tell us a little bit more about yourself and what your path looked like that led you to where you are today. Yes, well Jenn thank you. First I just want to say thank you for having me participate in this honor, it’s really an honor to be able to spend some time with you talking about business and LGBT business. Yeah, so wow where to start. Well this is really great timing because I recently launched my new company, Richard Oceguera Coaching, as you mentioned, and it’s exciting for me because it’s an opportunity to bring together 29 years of experience in sales, marketing, business development and personal development, and really translate that to the clients that I’m working with. And specifically I work with entrepreneurs, business owners, as well as people who are in business development or sales capacities. And it’s really wonderful to have the opportunity to take this experience and have it make a difference for other people as they’re building out their businesses. So that’s a little bit about what I’m doing now. But you asked about the path that led me to where I’m at today, and I think that’s a very interesting question. And you know my path has not been clear cut. I’ve done many different things over the years and certainly if I mapped it out it would be quite a zigzag of different experiences. But they’ve all had something in common one way or another and that really boils back down to sales and working with people. And I got my start when I was fourteen years old selling- as a telephone marketer, fourteen years old, calling people and asking them if they are aware of the quality of their drinking water in their home. And having a conversation that would lead to actually having a salesman go out, a Culligan water man, to test their water and ultimately probably determine that in fact their water quality is not as good as it should be and sell them a Culligan water system. So I learned at a really young age how to be on the phone with people, complete strangers, we cold called, 100% cold called, developed a rapport with someone, and then have them be open to taking action on what I was offering. And on the other side of that was when the Culligan water man made a sale, I also got a commission. And so I learned at a really young age what it’s like to work on a commission basis and to really be in charge of making as much money- making money equivalent to how good you are at, in that case, being on the phone. And that’s how it started. And thereafter everything that I’ve done has somehow been related to working with people in some kind of sales capacity, and I’ve sold everything from Culligan water to cosmetics to hypnosis treatments. That was a really fun job. To advertising and more recently as you mentioned, through the National Gay and Lesbian Chamber of Commerce, New York; Chamber memberships. So a really, really broad range of experience around business and sales training. And now I get to use all of that in service of the clients that I’m working with through my coaching company. That seems really exciting to be able to compile all of your past experience into just one amazing core product for your clients, that’s excellent. Before we get into more of the deeper questions around business and marketing, I am curious to know what is one fun fact about yourself that very few people know or would expect from you. What kind of party is that? Yeah. And it was called Ecstatic Dance NYC and I thought, ‘Hm, this is very interesting.’ So I went. I didn’t know a soul there, but I went. And what I discovered there was this amazing world, this whole community; it’s actually worldwide of this movement that’s called Conscious Dancing or Ecstatic Dance. And I have just jumped into it and very few people know that I’m doing this but it’s such a great way for me to express myself and it’s really great exercise for sure, and I just can’t get enough of it. So I think that’s my big secret. I love dancing and I can’t get enough of it. That’s awesome. So moving to our next question. What was your ‘ah-ha’ moment? When you realized what you’re doing right now is what you were meant to be doing? That’s an interesting question because I do so many things, right? So aside from the coaching business I do have another company called Merchant Mart USA and we work with entrepreneurs and with business owners to help them save money on credit card processing costs. And this is a really great business and I’ve had it for about seven years now. And I’ll continue to have it for who knows for how long. But the question you’re asking really makes me think about my newest business which is the coaching, Richard Oceguera Coaching. And for that, I can really say there was an ‘ah-ha’ moment. I had signed up for a coaching program myself and I did it with the intention of really looking at my business, Merchant Mart USA and how to build that out and beef up my client base. And so I show up to a weekend intensive around thinking I’m there to really look at Merchant Mart USA and what are going to be my next steps. And my mentor, who leads the coaching program, we’re sitting in this pod of people, maybe it was like ten folks, sort of like a breakout session. And I’m talking about Merchant Mart USA and she looks at me and she’s like, ‘This is not you. That is not what you’re supposed to be doing. It’s great, you should keep doing it kind of like your day job. But there’s something about you that’s different. And you’re really meant to have a much bigger role and I’m not sure what that looks like.’ And at first I was start of startled because here I spent all this money to be in this coaching program with her around Merchant Mart USA. And then I was confused like, ‘What do you mean? Of course this is what I’m supposed to be doing.’ And it sort of was like a seed that took root and very quickly from that point on, it became clear that- this might sound weird but I feel like my calling is really to work with people like this and on a coaching level to build a company out that is going to make an impact for business owners in a really big way. And that was really, I would say, the ‘ah-ha’ moment. And as soon as I made that decision, as soon as I made a choice, to go down this road all kinds of things started to open up and projects that I had been working on that needed to end had come to an end and new doors have opened and clients started coming to me. My first wave of clients basically all came to me and I didn’t even ask them to work with me. They told me they wanted to work with me. So it’s lots of signs pointing that I’m doing really what’s supposed to be- how I’m supposed to be showing up in life. That’s a really inspiring story and that actually leads perfectly into our next question which is what inspires you and keeps you motivated to continue doing what you’re doing? Yeah. I think about this question and there’s maybe two answers to it. One thing that motivates me and keeps me going is without a doubt my own personal spiritual practice, which I take very seriously. And it seems to become more and more important to me the older that I get. So staying grounded and being connected to my source and to what’s important to me on a spiritual level really keeps me connected to what I’m doing- what keeps me connected to all the other areas of my life and really I see it show up in my business. And another thing that motivates me is seeing the results that people get from working with me that’s specific to the coaching business right now. Seeing that the work we’re doing together is making a difference in their lives and that they’re taking what tools and the strategies that we’re coming up with in their sessions and applying it, and having their lives move forward in pretty dramatic ways. That is motivating, and that’s really part of my big ‘why.’ Like why I do anything. For me it’s important that I make a difference in the world, and that somehow through me other people see just how important they are, and that they really get for themselves that they have the power to do anything they want in their life, and that they can make a difference right now in their own lives if they just take action. So that’s what keeps me motivated. That seems like a really gratifying way to be; that’s excellent. And the next question I want to ask you is around business advice. And for somebody who is a business coach, this I feel like will be a really interesting answer from you. But what is the one piece of business advice that was just the best that you were ever given. And then on the flipside, what’s one piece of business advice that you feel that you give to your clients that’s that really good gem of wisdom? Yeah. And it’s always been sort of in the back of my mind and I’ve like held on to that piece of paper that I wrote it on all these years. And that’s really great business advice because when we sort of just get into our groove and we think everything’s good and we’re not looking for ways to expand and explore and constantly looking at what’s working and what’s not working. Or what’s missing from what I’m doing that if I put that into my game that it would make all the difference and elevate my business to another level. When we’re not doing that and we’re just kind of going with the flow and letting life happen, then we end up complacent and then stagnant. So that’s great business advice that I’ve used and continue to use in my career. In my advice that I give other people, you know one of the things that I work with on the coaching level, one of the very first places that we go to in our conversations is around being clear on your purpose, on your ‘why.’ Why do wake up in the morning? Why did you start this crazy business? Why do you keep showing up to work on your business? If you’re not connected to that as a foundation, then it makes it really hard for you to continue going, especially on days when you’d rather not be doing anything. When everything goes wrong, when the problems pile up, or the number of people that you need to bring on board, it isn’t happening. Or in the mail just comes all of the invoices instead of the checks that you’re waiting for, for your clients’ sake. And that’s all happening. Those days is when you need this the most. It’s what is your purpose? What is your real underlying big ‘why’ for your life? And that’s where I start my clients with is asking them that. And my advice is you’ve got to be clear on that, you’ve got to know what it is because anything else on top of that isn’t really being built on a firm foundation. That’s really concrete advice, that’s awesome. So let’s switch gears a little bit and go from the business side of things over to marketing. 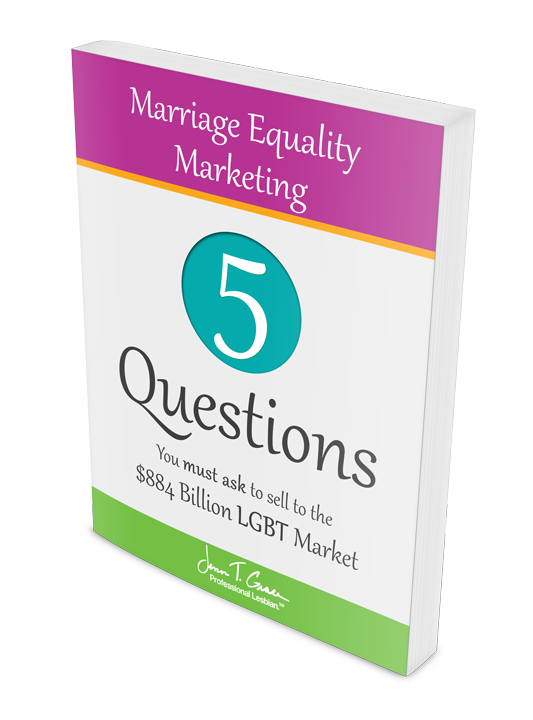 And as you know, this podcast focuses around the LGBT community and marketing to it. 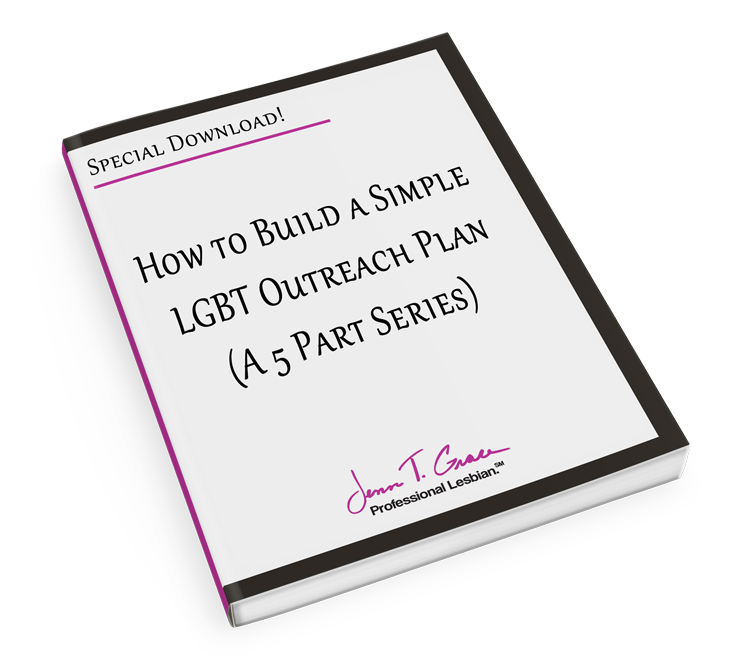 So if you were to give the listeners one piece of advice that you feel would help them be successful in marketing to the LGBT community, what would it be? Well to me that’s an easy answer. You need to become part of the community. Of course I don’t mean you should become gay, but there’s so many companies- and right now I’m speaking more from a corporate side point of view. Is it’s increasingly becoming hot, it’s becoming acceptable and maybe even a little trendy for corporations to show that they support the LGBG community. And on one hand that’s great, and so many of us have worked so hard to see that kind of movement take place. On the other hand, if it’s just a display, kind of like checking off the box, it doesn’t work. And one way that it doesn’t work is when a company comes on board to sponsor an event or to get involved with an organization like a chamber of commerce; if they’re just doing it because it makes them look good, that only lasts for a little bit. What really makes the difference is when those people from those companies actually show up at the events, when they participate and get to know who the people in the community are that they’re targeting. So you know, business is business and business involves selling things, and we all get that. So if you’re going to sell to me your bank’s services, I want to know that you’re actually showing up to the events that I attend and not just showing me your logo. So my advice would be really get involved with the communities that you’re putting your money in and get to know people, build relationships, and that’s going to have a much bigger impact on your overall marketing plan. You’re going to build relationships rather than just building a presence. I couldn’t have said it better myself. 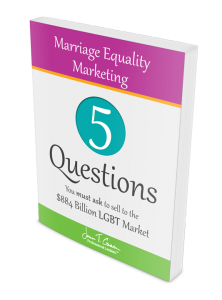 So along these same lines, as an LGBT person yourself, is there a way that you have been able to leverage that status as an LGBT business owner to further advance your business? I love that question! Yeah, that’s a very interesting question. And I guess the answer is yes. Being involved through my community, having the opportunity to be the founding president of NGLCC New York and really working on that over the last four and a half years. Prior to that, starting the LGBT committee, the first ever LGBT committee at the Manhattan Chamber of Commerce, which is a mainstream chamber here, it’s the largest chamber in New York City. And also serving for many years on the leadership council here for HRC, the greater New York steering committee for HRC, and being involved with other LGBT related organization. I’ve very systematically over the years built up a community, my own community, of people that I’m connected to. And I wasn’t always in business for myself through this whole period, but when I started Merchant Mart USA for example, my initial clients came from the LGBT community. 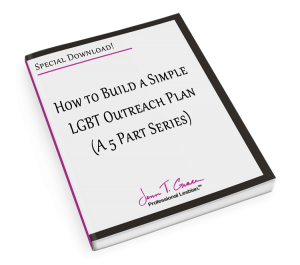 Being able to leverage, or monetize- another way to look at it, my connections to build my business, was in the beginning it was very useful to draw on the contacts that I had in the LGBT community. And now, with rolling out Richard Oceguera Coaching, I’m doing the exact same thing. And at this point I have many more contacts and my initial clients have all come through the LGBT community. I’m reaching out not only to individuals but also to corporations, to provide business development and relationship building training for folks who work in corporate settings. And you can bet your bottom dollar, to quote Annie (I don’t know where that just came from). I promise you that every contact that I’ve made through my relationships over the last year, especially through the chamber, they will be hearing about what I’m doing and how they can play a role in helping me build my business. Absolutely. And based on all of the answers that you’ve given to the questions, it’s very evident and clear as to how you have become the author of your book titled ‘Convert your Community to Cash, Monetize your Connections.’ It seems like it’s an absolutely perfectly fitting title for your book because that’s essentially what you’re doing, which is awesome. So actually talking about books, my next question for you is what is one business book or program or tool that’s just really transformed the way you’re able to do business? Yeah, well I’m definitely going to answer this question and you just made me think of something though about the book that I’m writing that I think is important for people listening to hear. And when people hear the title of my book, ‘Convert your Community to Cash, Monetize your Connections.’ That’s a pretty bold title and some people have a reaction to it like, ‘That’s not right. You’re just making money off of people.’ Well, that’s how money is made, through people, right? And so what I talk about in the book is really about how you build up over time a database, your database of connections. But not just like a static database, I like to think of it like an ecosystem; I call it your business ecosystem. Where you have lots of different kinds of people in your community and you are giving to them actually before you’re expecting to get something back from them.  And the chamber of commerce, NGLCC NY is a really great example of what I would call now a very sustainable business ecosystem. Where I’m able to walk away from it now and I know that it’s going to stay intact because the number of people involved and the nature of the reciprocity that is displayed in the chamber with people supporting each other, doing business with each other, will stay intact. And I believe that any business owner can build that same kind of community and convert that- be able to monetize your community for your own business building purposes. And under the fundamentals of all of this is a concept that’s this: it’s money doesn’t really come from people, it moves through people. So it’s kind of the core underlying focus of my book. Of having people understand that in order for money to move through people, then you have to keep building your community, you have to keep building your network and building those relationships. Because you don’t know who your next opportunity is going to come from. And you don’t know who that person knows. And you probably know this from your years of experience, many opportunities come from friends of friends that we make. Friends of that contact that we just made. So people just become really inherently important and the more folks that you’re cultivating and grooming and giving to, and not just expecting to getting from, the stronger your ecosystem becomes and then money just starts to flow and opportunities start to flow through that process. That’s so well put. That’s absolutely spot on. And I can’t wait to buy your book, I’m exciting. I can’t wait to sell it to you. You’ll be my first sale. Now to answer the question, you did ask about book or program that transformed the way I do business. For sure, without a doubt I have to say that it was taking the Landmark Forum, which is a program offered through Landmark Education and Landmark Education is a global training and education company with literally centers all around the world and we have one of the largest centers here in New York City. And somewhere around 2005 I heard about it and decided to just go and attend, I didn’t really know what it was about. I thought it would be motivational and it would make me a better sales manager; I was the sales director actually for Metro Newspaper which is one of the largest newspapers in New York City now. And I thought I was going to get some brush-up on people skills and sales skills, and what actually happened was my entire life got transformed. And I learned about the value of integrity in a completely different way. And I learned that I can do anything that I want in this world by creating it as a possibility, and then sharing it with other people and having them be inspired by what I’m up to. And it was very revolutionary for me to see my life in a completely different lens, and it was very empowering. And I went on from there to participate in many other Landmark programs which have just absolutely shaped how I think about the world and the tools that I’ve learned from these programs I use in so many ways continually. So if you’re in business- well really anyone, but we’re talking about business here, the Landmark Forum is one of the best investments you can make in your own training and development. That’s really interesting and one thing to note is that all of the links and the resources that we’re talking about here will be available on a blog post that goes specifically with this podcast episode. So I can make sure that I include a link to your book and Landmark since that seems to be something that was really beneficial for you and it might be something that’s beneficial to those who are listening. Absolutely, yeah. And that’s where coaching fits in very nicely because it’s one thing to go to a program and get some great tools and be inspired and motivated. It’s another thing to maintain that and to build it out in your life on an ongoing basis. Because at the end of the day we’re talking about changing your neuro pathways, we’re talking about building new habits, new mental habits for how you operate in life. And that takes time and it’s really how coaching is such a valuable tool for business owners to identify the areas that need development and areas that need growth, and then to systematically work on that over a period of time. Yeah and another thing that I think coaches are extremely valuable for is that piece of accountability. Because you can go to a training or a seminar and you walk away with 100 different ideas that you want to implement; but if you don’t have someone there other than yourself holding you accountable for actually implementing and executing things that you’ve thought of and would really help transform your business, then it’s kind of that missing piece and coaches certainly provide that. Absolutely. I mean you said it perfectly, and the most successful people in life, entertainers, sports figures, actors; they don’t do it alone. Top CEOS, they have advisors, they have someone who holds them accountable but who also can see in them what they can’t see for themselves yet. And that’s what’s fun about coaching is for me, I can so clearly see exactly the possibility for someone. And they can sense it, and that’s usually why they go into a coaching program, but they haven’t been able to spot on see it with their own eyes. And the process of having them get related to that and then take actions that are necessary to have them step in and own that part of themselves; that’s really exciting. And that’s exactly what actors do, it’s what Oprah Winfrey does. She has a coach, she talks about this. People who are successful know they can’t do it alone, and they don’t want to do it alone and they’re happy to bring someone on board to help them through that. Definitely and I know that from my own experience working with a business coach, she has transformed the way that I look at things. From just being able to help you figure out where your strengths are and how to play to them, and then where your weaknesses are and then how to basically build a team around you that can offset those potential weaknesses. And just in the year and a half that I’ve been working with her, where I was a year and a half ago to where I am now are completely night and day. And it’s because I’m able to have that advisor there who can steer me in the right direction; should I be potentially going down the wrong road? Because like you were saying, she can see that bigger picture that sometimes as the person who’s living it, they may not be able to see. That’s really good stuff. So before I ask you my last question, is there anything else from your book that you would like to share with the audience? In the book I talk a lot about building your community and different ways that you can do that. And one thing I would love to say since we’re talking to a business theme here; one of the mistakes- let me say it this way. I’ve interviewed several successful business owners in the process of writing the book and I’ve asked them what they think is the number one mistake that they see other people do in a networking environment. Yeah that makes perfect sense and perhaps I think along the same vein because we both have one common past experience was running the LGBT chamber of commerce, but I know that I usually start my conversations with people of, ‘How can I help you,’ or ‘Who can I connect you with?’ Because then they see you in that positive light of being a connector and being someone who’s willing to give before they’re asking for something, like you were talking about before. So that’s a really great point. One of the things that kept coming up in the interviews that I did for the book was this same concept that it’s really important to give to people before you expect to get back from them. And one way, when building new relationships when you’re in a networking event is if you’re listening to them, you’re thinking of the connections that you can make right then and there. And being able to on the spot, or in that same evening, take someone over to meet the exact kind of person that they just said they need to know, really goes a long way with building up your credibility and building up trust. And one thing that you and I both know from being in business, is people do business with people they know, like and trust. And the trust factor, that’s what takes some time to build up; it doesn’t happen in one meeting, it’s a process over time. And I can’t stress enough how important it is. That’s very valuable advice and something that you and I are already practicing, so hopefully those listening will pick up a tip or two. Let’s see, so on to our last question here. And I have a hunch I might know the answer to it, but what is one thing in your business right now that just is really exciting for you? All of it! Well because you know the coaching business is really brand new, one thing that’s exciting for me just as an entrepreneur is that whole startup phase and the excitement of having a vision, having a goal, and not necessarily having all the answers to how it’s going happen. That’s exciting. Another thing that’s exciting is seeing the response that people are having to me having this business. It’s really gratifying to hear people say like, ‘Oh my God, that’s exactly perfect for you. Of course that’s what you’re doing, who else would do this? This makes sense.’ That’s very validating. And the newest thing that’s exciting for me is I’m launching a series of events that will take place here in New York City over the course of the year. A series of workshops that eventually will lead to my first ever three day event. Yeah. So the process for putting that into existence and planning for that is super exciting and it’s going to be not only exciting, but fun. I love leading, I love getting information to people and having people get value from those kinds of interactions. So there’s all kinds of stuff that’s going on that’s exciting for me. This has been a great interview because you do have so many new things that are going on and I definitely thank you so much for taking the time out of your day because it’s very apparent how busy you are. But before I let you go, why don’t you give yourself one last plug and let everyone know where they can find you and of course I’ll make sure that the information you provide is linked in the notes to this as well. Jenn, thank you so much for the opportunity to plug myself, I love that. So what I’d really love to do for everyone who’s listening to this podcast, is give you an opportunity to experience a little bit of what it’s like to work with me as a coach. And so I’m offering you what I call a ‘Business Breakthrough Session.’ And it’s complimentary, it will be thirty minutes, and you can sign up for it by visiting my website, www.RichardOceguera.com. You’ll find on there pretty easy how to sign up for the strategy session. So I encourage you, if there’s something that you’re looking to create in your business, if you’re looking to elevate your business, if maybe you’re blocked or you’re stuck somewhere in your business and you know you can break through but you’re not sure how; this is a perfect opportunity for you to bring that to the call and we’ll take a look at that. And in the call I’ll also explain to you how my coaching program works and what it would look like for you to take advantage of being in my program. So take me up on this offer and visit me at www.RichardOceguera.com. You can also find me on Facebook, my personal page as well as my business page, LinkedIn, Twitter; if you just type in my name on any social media outlet, I own my name on those pages and you’ll find me. Why don’t you do the audience a favor and spell it out for those who don’t actually make it over to the site to get those links. Perfect. So you can find me on www.RichardOceguera.com. Oceguera is spelled O-C-E-G-U-E-R-A. So look me up at www.RichardOceguera.com. Perfect, thank you again. I appreciate your time.